When I go to Alice’s Teacup for breakfast with my wife, I have an excuse. She’s the reason I’m there. One of my friends described the place as “girlie,” and she’s probably right. I don’t care. I like it. With my wife out of town this weekend, I had to summon all the courage I have in my masculinity to go there alone; somehow, I was able to do it. I was rewarded for my efforts with small, tea-type sandwiches, warm scones, and a tea with the name “African Dew.” I liked it. Every bit of it. What really blows me away about Alice’s Teacup is the waitstaff. The waitresses not only wear fairy wings while doing their jobs (and doing them well), they seem comfortable dressed that way. You get the sense that the young lady bringing you your roasted cumin carrot sandwich dreamed of wearing fairy wings to work as a little girl and is now living the dream. They seem happy, and I’m happy for that. I want to wear a cape to work and just can’t get away with it. Sure, their chosen (or required) attire seems a bit odd to me, but they are happy. That’s what matters. 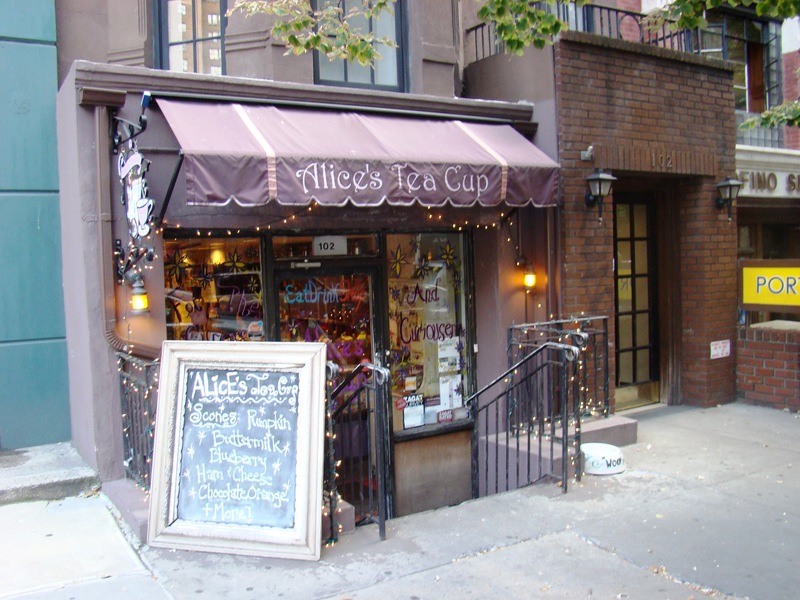 This entry was posted in New York and tagged Alice in Wonderland, Alice's Teacup, breakfast, brunch, Columbus Ave, Dining, food, Mad Hatter, sandwiches, tea, Upper West Side on July 27, 2008 by Tom.